The parents dances at this Roma's Hospitality Centre wedding were a delight to photograph. They were without a doubt some of the most emotional moments I experienced during my career as a Toronto wedding photographer. The image on the left features the bride and her father performing the traditional father daughter dance. In a spontaneous gesture, the brides sisters came on the dance floor and embraced the bride and her father. That is a touching image of the four daughters dancing with her father in unison. The image was shot using a Canon 35mm F1.4 lens stopped down at F2. For this image I applied a Dutch tilts technique by rotating thing the camera clockwise by 15° to give the image a better flow. The flash placed behind the subjects introduces a flare as a new element of interest in the picture. 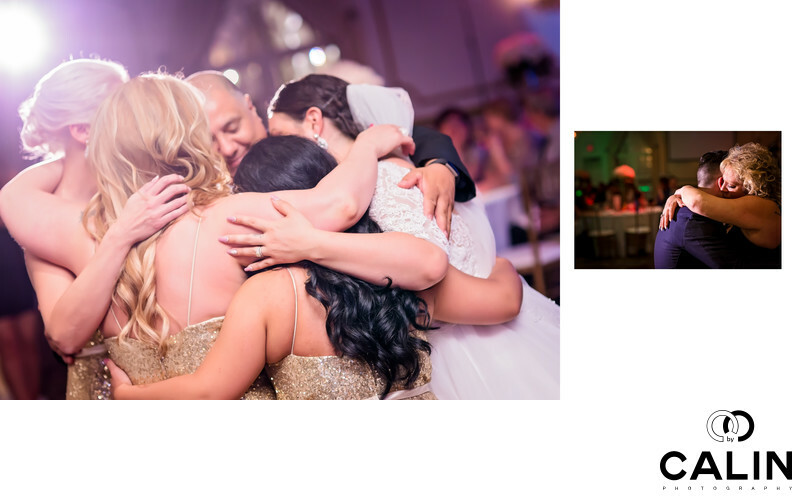 The image on the right captured a touching moment during the mother son dance performed by the groom and his sister. The groom's mother passed away a few weeks before the wedding and this dance was very emotional indeed. Both images employ layering as a technique of telling multiple stories. In the foreground we have the subjects while in the background we can see, out of focus the guests watching the subjects of or frames dancing. In post processing I applied skin softening in Photoshop and adjusted the white balance. In addition, increased the vibrancy of the colours and added a discrete vignette to emphasize the subjects in each picture.